Fill this clear glass table lamp with any lightweight collectible for a custom home decor accent. This fillable glass table lamp allows you to easily update your decor on a whim. The clear glass body can be filled with small keepsake items, collectibles, or other lightweight decorative pieces for a truly unique decor accent. A white drum shade up top lends itself to any collectible you put in the base, and it also creates a pleasing glow in the room. Easy on-off switch for operation. Overall: 21 3/4" high. Base is 5" square x 1" high. Shade is 11" across the top x 12" across the bottom x 9" high. Weighs 4 lbs. Takes one 100 watt standard base bulb (not included). On-off switch on the socket. Square-shaped, fillable glass table lamp by the 360 Lighting brand. Comes with shells as shown, or add your own lightweight collectibles. White drum shade. 7 1/2-foot clear cord. 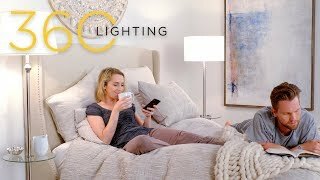 Looking for a coastal lamp ! I wanted something a little different and I could personalize to what I like. I have been looking for a fillable lamp for a gift, but am on a budget. This lamp appears to be the best choice for my friend. I live in the Midwest where the Winters can seem long and can become extremely cold. To battle that "Winter Blues" feeling my living room is a beach themed Oasis for me. This lamp looks to be a perfect fit to add to my Oasis feel livingroom. Sick of ugly lamps i have. like the option of changeing these lamps with the seasons or whatever. just what i have been looking for. The room I am purchasing it for has a nautical theme and we have seashells from vacations that will be beautiful displayed in the lamp. Iliked it and the idea of being able to change it according to seasons etc. I live in Central FL. My 90 yr old mother has just come to live with me. I thought she might enjoy collecting shells from the beach and filling the lamp for her room. They live by the ocean and I thought they would enjoy the shells. I have a small house that I am decorating in cottage/farmhouse style. I have collected sea shells over the years and this seemed like the perfect way to display them and the price was right. House warming gift for a friend that loves to display shells and stones. Because its versitile....i can change the style in the base or the base color to whatever i want. beautiful glass square lamp with beachy look and seashell lovers storage. a perfect match for our beach house! Need a lamp for a small table in my living room. Hope this one works out. I am avid seashell collector & just moved into new condo that I’m decorating in beach decor. Can’t wait to fill this lamp with my treasures from the beach!!! Great style. Looked all over in our beach town and could not find anything like this!! Pretty. Beach house. Grandson can fill w shells. Just moved to a beach area and like the idea of having guests collect their own shells to create a lamp base. Traditional design that fits in most any room. Very beautiful! Needed a smaller lamp for my living room. I like that I could put my own touch on it to coordinate with my costal room. 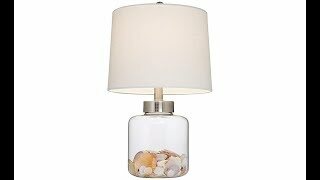 I am doing a beach theme room and have sand and shells from Sanibel Island..From all the lamps I looked at ( fillable) this was the nicest one.. Very creative! Can change according to the season of the year! Can base be filled with water and artificial fish? BEST ANSWER: I wouldn't try it. I doubt the base could hold water without leaking, since that is where you have the opening for the shells. The lamp comes with bags of shells you insert through an opening in the bottom of the base. Can you buy additional shells to fill or already filled? BEST ANSWER: You can fill it with whatever you want. We are letting our grandchildren collect shells, rocks, tram tickets when they come for vacation and adding to the collection each year. Sure. Don’t know if available from this store, but, loads available on Amazon! Very cute lamps! The lamp comes with some shells. I filled it completely with shells I had gotten at the beach. This lamp comes with shells but you can easily add more to fill to the level you wish. You can add your shells. It comes with some but you’ll probably want to add to it. It's says light wieght items.so no rocks? Why not? BEST ANSWER: I added small rocks and shells to mine with no problem. Looks very pretty with amethyst and quartz crystals mixed in with small translucent shells. The description says you can fill it with lightweight items. I want to use colored glass beads, which can get a little heavy. Is there a reason something heavier like that wouldn't work? BEST ANSWER: Hi, it will be okay to fill the lamp with the colored beads. I like collecting rocks from hikes I've taken and sea shores walked. I filled my lamp with these rocks so they are displayed where I can enjoy them every time I turn on the light. Of course I am not moving the lamp. It sits on a table next to the couch. I don't think glass beads would be a problem as long as you were careful setting them in.Sounds pretty too. I actually filled it with sea glass. Love it! Is this filled through the base? How large is the opening? BEST ANSWER: Yes, the lamp is filled through the base. The opening is approximately 4 inches wide. What color is the shade exactly? White, off white, cream or beige? BEST ANSWER: The shade is white. It is not a pure white but it is still considered white. It is definitely not cream or beige. Is the shade an off white , white or beige? BEST ANSWER: Hi - this design has a white drum shade. Does the cord come out of socket or base? It comes out of the base. what's the diameter of the opening? BEST ANSWER: Hi Sylvia B., I bought this lamp for my son back in September. He loves it! I believe the diameter of the opening is 4 inches or so. He filled all the shells (included) into the lamp with no problem. Is the opening large enough that you can fill it with golf balls? BEST ANSWER: No not that big. When you say 21 high is that with shade height or without? BEST ANSWER: Hello - The height includes the shade. to the shells that came with it as well as some shells from our area. It's about 23" tall if you include the chrome ball finial. The height measurement is to the top of the shade. Shells that came with the lamp are lovely, but I will use my shells from Sanibel Island. Lamp base could be a bit nicer. This lamp adds the right touch to my costal decor living room. I love the shape, it had the look of a jug found in the water. These were a great gift for our friends who have a beach house! I bought two of these, and really like them. These arrived on time. My only issue is that one of them had/has a small crack up around the neck. This may grow into a problem with time, but for now it's not noticeable and--to me at least--wasn't worth returning the item over. I really like this lamp. It goes with my beach theme. The price and shipping were great. The bottle breaks easily forming sharp shards of glass. This is a real hazard in homes with children, pets or visually impaired people. Hi Minerva R H., I'm so sorry to hear that your lamp broke. Please contact our customer service team at 877-704-2425 for assistance with this. Thank you. perfect for what we wanted. A little fragile as the base looks hand blown with different thicknesses of glass. Filled it with shells. Beautiful! I bought the lamp so I could fill them with shells I collected on the beach. It takes a lot of shells to fill the lamp but it looks great. Gave it as a gift and was very well received. Plan to do another. We took a.trip to Florida and got sand and seashells from the Atlantic and pacific. And this lamp was perfect to display our findings and to have a memory all the time to see. I love this lamp however the piece that supports the shade was not in the box. Shouldn't this come with the lamp ? Can you send me one ? Hi Christina T., glad to hear you love your lamp, but we're so sorry to hear that the harp was not included in your packaging. Our customer service team has reached out to you to confirm your replacement harp order. Please reach out to them if you have further questions. Thank you. This is a great little lamp! I bought 2 of them, and the packaging was AMAZING!! It took a while to unpack the lamps, but they were in perfect shape, NOTHING damaged, dinged, or anything! I had planned on getting more shells for the lamp (I didn't realize that shells actually came with the lamp!! ), but I thought the shells they sent were great, and the amount of shells included were just enough, and not too much!Plus they were really lovely! I have had several complements on these lamps! I have the lamps on a small table with a beachy painting behind them. This worked out well in the bedroom I put it in. It wasn't difficult to assemble; however, there seemed to be a lot of warning about only using a certain wattage of bulb because of fire hazard with the shade. It seemed more than the usual caution. That should probably be in the description write-up. The lamp is attractive, and true to the picture. It's really difficult to add shells or anything else through the bottom entrance. You can't place things the way you want. You can only shake them gently and hope they fall into place. They don't. Also, lamp arrived without the harp that holds the shade. Had to wait 2 weeks for it. Then it didn't have the finial, that screws on top of the shade. Still waiting. Customer service reps are nice, but doesn't make up for needing 3 separate shipments for 1 lamp.